By the time your child is five years old they will have spent lots of time away from you. First at a toddler group, preschool or nursery and then at primary school. Going up to ‘big school’ is a huge event in a child’s life and is also the time when they begin to form friendships, start to discover their strengths and weaknesses and become a little more independent. Simple tasks like wiping their own noses, cutting up their food themselves and sitting and eating their lunch sensibly with their friends all show how much they are growing up and how they are becoming more able to take care of themselves. However, as parents, we need to manage our expectations of these children and this becomes very difficult if there are younger siblings in the family. All of a sudden your five-year-old appears to be very grown up and capable of some amazing things, at the same time we start to think that they really should not be behaving like ‘little children’ any more, even though they still are very young! Seeing your child in their school uniform or hearing them read at their class assembly also gives us the impression of a child who is older than their years and capable of far more than we thought. That same child will be playing with their Lego when they get home from school, watching CBeebies on the telly and having fish fingers for tea - remember they are still only at primary school and will still need lots of cuddles and affection, reassurance and help with things. 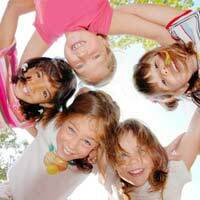 Your child will probably want to start having friends home to play after school, and by the time they are seven or eight may well be taking an active part in after school clubs and activities such as sport, art, drama and music. These extracurricular activities should be encouraged because it is important for children to experience lots of different things, mix with different people and discover their likes and dislikes. However, the competitive parenting approach that all too many parents are guilty of adopting, should really be avoided. Children also need time at home, to play, rest, loll around on the sofa and annoy their siblings (and parents!). That’s what being a family is all about, and it’s important that children have down time to relax and be themselves. It is at this stage that they begin to find their own interests and make decisions about what they like to do and how they choose to occupy their time. Parents should keep a close eye on habits such as watching too much television and playing on computer games for too long, and try to offer varied activities after school that involve getting outside, creating craft projects and reading together. A well balanced approach will result in a child who has many varied interests and who has a lust for life and learning new things. It is very easy to sit our children in front of the television while we ‘get on’ with things, and everyone has to do this occasionally, but it is also important to spend time with our children, listen to what they have been doing all day and discover activities and projects that they really enjoy that you can do together. At all ages, a routine and structure is important and too much flexibility particularly around meal times and bed times can prove to be disruptive and damaging to the whole family. It is far better to keep later nights and treats for the weekends and the holidays so that everyone can really benefit from them and look forward to their days off.